In northwestern California the Mendocino National Forest straddles the eastern spur of the Coastal Mountain Range. The Mendocino National Forest is about 65 miles long and 35 miles across, and the forest’s 913,306 federally owned acres of mountains and canyons offer a variety of recreational opportunities such as camping, hiking, backpacking, boating, fishing, hunting, native study, photography, and off-highway vehicle travel. The Mendocino National Forest is the only one of California’s 18 national forests not crossed by a paved road or highway which makes this a very special attraction for people seeking an outdoor experience of tranquility and solitude. The Mendocino National Forest however, is a working forest as well as a recreation area, and resource activities such as logging and grazing do occur on both National Forest lands and private holdings within the forest. Elevations in the Mendocino National Forest range from 750 feet in the Grindstone Creek Canyon in the Sacramento Valley foothills eastern edge to the 8,092 feet of South Yolla Bolly Mountains in the northern part. The average elevation is about 4,000 feet. 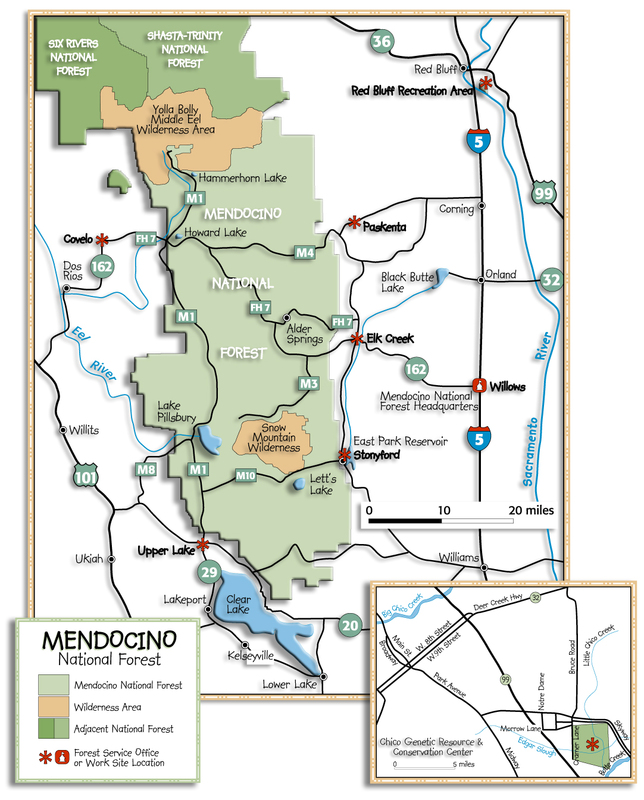 There is three ranger districts in the Mendocino National Forest. They consist of Covelo, Grindstone and Upper Lake. There are two units managed by the Mendocino National Forest which are not located within the forest proper. The Genetic Resource & Conservation Center and Lake Red Bluff Recreation Area. Four wilderness areas which are partly or wholly managed by the Mendocino National Forest are the 37,679 acre Snow Mountain Wilderness, the 147,070 acre Yolla Bolly-Middle Eel Wilderness, the 53,887 acre Yuki Wilderness, and the 10,571 acre Sanhedrin Wilderness. A little history of the Mendocino National Forest. It was back in 1902 when the first surveys were conducted by what was known as the United States Forest Service, to determine what land should be included in a forest reserve. In 1905 the United States Congress moved the reserves from the General Land Office in the Department of the Interior to the new Division of Forestry in the Department of Agriculture. The Division of Forestry became the U. S. Forest Service. Because of the difficulty of managing such a large tract of land, the northern portion was reassigned to Trinity National Forest, the the final boundaries of the new Stony Creek forest were drawn and was signed into law by executive order of the president on July 2, 1908 and renamed it the California National Forest. But on July 12, 1932 in order to avoid the confusion growing out of the state and national forest there in having the same name, stated President Hoover signed an executive order renaming it to what it is today no known as the Mendocino National Forest. This entry was posted in Mendocino Interest and tagged backpacking, boating, camping, coastal mountain range, covelo, fishing, hunting, native study, off-highway vehicle travel, rainbow trout, recreation area, sacramento valley foothills, salmon, steelhead, tule lake, u. S. Forest Service, upper lake, yolla bolly wilderness. national forest, yuki wilderness.